But it needn’t be true. Let me introduce Jacob Musyoki (see picture). 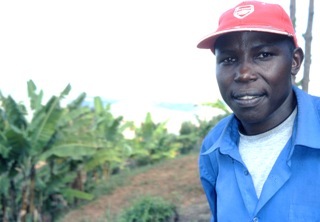 I met him in Kenya after buying his green beans in a supermarket in London. Or, at any rate, after buying beans collected from hundreds of smallholder contract farmers such as Jacob, and air-freighted from Nairobi to London by Homegrown Kenya (now part of Finlays Group). Jacob told me: “Before I joined Homegrown, I made 3000 shillings a month [$35], now it is 20,000 shillings [$230] most months.” On that money, he didn’t have a car or a motorbike, but he had a TV for the first time, could buy his wife nice dresses and had just put a concrete floor into his hut. Farmers nearby, in the sandy hills of Machakos, were returning from the cities to take advantage of the good times, he told me. I thought about Jacob when reading Andrew Noble’s recent post here in response to my own piece condemning land grabs. He said “young people do not want to continue in the drudgery of farming. Too many defenders of smallholders romanticized it”, when what was needed was to transform smallholding. Otherwise, it was curtains. Fair enough. But the good news -- in case readers thought he was simply writing an obituary for the peasant farmer -- is that the transformation can be done. Collier wrote in The Times that the backers of smallholders were indulging in “a retreat into romanticism,” and that “large swathes of Africa... could be used far more productively if it were properly managed by large companies.” Smallholders had to get out of the way. But most recently, the veteran former president of the Rockefeller Foundation, Gordon Conway, largely took the smallholders’ side in his new book One Billion Hungry. While conceding there was a case for some big farms, Conway argued that for the foreseeable future, millions of smallholders will supply most of the world’s food. And he felt that was good news. “There can be a green revolution in Africa,” Conway said recently. “It will be driven by smallholders – the 33 million smallholders with less than two hectares, the people from whom that continent gets 90 per cent of its food.” What they needed was support, from researchers and others, to do it better -- and, like Jacob, to find better markets. Ecologists may suggest a downside. If we leave food production to smallholders, won’t they chop down forests to annexe the land for their low-tech enterprises? I argued here last month that there are a number of reasons why that isn’t true. The most pertinent point to make here is that, as Conway says in his book, smallholders are “in many respects highly efficient [and] produce more per hectare than large farms.” There is no reason why they should need more land than agribusiness. Yes, some yields in Africa are distressingly low. But, as Malawi has recently shown, those yields can also swiftly be transformed with a few basic inputs, such as affordable fertiliser. Moreover, smallholders must be doing something right if they can retain a competitive edge in international markets for products such as cotton. Some people continue to question the argument that smallholders can produce as much as their big brothers. But we should be wary of crude statistics that measure monoculture yields per hectare. These are metrics designed by agribusiness to make its case. Smallholders may often grow fewer tonnes of grain on each hectare. But they also have chickens running in the yard, goats grazing the hedgerows, cattle supplying manure and dairy products and, like as not, kitchen gardens growing vegetables and fruit where agribusiness would park its vehicles. Proper production metrics would include those things too. They might also incorporate the agro-ecological gains from mixed smallholder farming. Intercropping with legumes and pest deterrents, crop rotation, agroforestry, silvopasture and green manuring are all the stocks in trade of smallholders. More abstract concepts such as stability through diversity? Smallholders have been there and done that. As the International Assessment of Agricultural Knowledge, Science and Technology for Development (IAASTD) argued back in 2008, “making the small-farming sector profitable” is the key not just to sustainability, but also to strengthening food security round the world. could not agree more and as a small company we are looking for parntnerswo are willign to invest in wys that imporve the ability of small farmers to grow ad deliver a better crop. Would li to gein touch with the journalist and see if there is an opportunity for us to make some of the request for help noticed. Mostof the people require a small investment, which is buying may be some rabbits, offering some knowledge in how to set up a rabbitt culture, etc. Some of the communities have no access to water or health facilities or electricity, yet we ahve access to companies who wold deliver a solution from small to bigger/big. Companies do not do charity but are willing to look into a problem and into a solution. Often people do not have access to food because they can not access rasonably priced food but also because they do not know how to plant in urban areas, yet the migratio from rural arreas also happens because there are no facilities and not enough income to live on. We have a network of agronomists/engineers and other willing to give their knowledge, some of them charge some of them dont, but need to have their basic expenses covered. Agriculture though in Africa is not a new field and people know howto plant in rural areas, what they need is an exposure to the market. I've seen this kind of commercial market integration programme really work for small farmers. But I have to qualify that by saying that it can't work for everyone, perhaps only for a minority of small farmers. It only works if you have fertile enough land, water for irrigation, and decent market access. Farmers located closer to cities have a competitive advantage. Other farmers will still need some other way to live. I like the quote from Andrew Noble, 'Young people do not want to continue in the drudgery of farming. Too many defenders of smallholders romanticized it.' To remove the drudgery, you have to upgrade your technologies, which requires access to markets that pay enough. And that's not going to be everybody. I work with smallholder farmers, and I am a big fan of programs like the one in this article that raise living standards through market integration. But I'm constantly fighting those in the aid industry who want to keep EVERYONE on the land, regardless of circumstances. For a majority of the rural poor, the solution to poverty is employment elsewhere in the economy, which is why agricultural development needs to be accompanies by industrial and service sector development. You can't really have one without the other. PS I am in no way endorsing landgrabs or corporate farms. The debate between smallholders vs. landgrabbers is a false choice. Thanks Fred for sharing success stories on connecting rural farmers to global markets. As you mentioned there is a business case for companies to work with smallholder farmers while there are also incentives encouraging smallholders to supply modern agrifood value chains. This site will soon be featuring an Agrifood Chain Toolkit set up by the CGIAR to share methods and tools for value chain capacity building and analysis devised by researchers with field insights from value chain practitioners. As an ecologist, I would also like to make the case for smallholders. The impacts of monoculture on biodiversity and water quality are often devastating, because they reduce biodiversity and hence ecological resilience. This requires more pesticides and causes water contamination (also from inefficient uptake of non-organic fertilizers) and becomes a water quality management problem. The greater diversity of crops and animal husbandry allows for some native vegetation to remain, and for shorter and more efficient nutrient cycling. All these things support a more sustainable agriculture. It conserves the soil and requires less inputs for agricultural production. From that perspective it is probably more efficient than large scale farming for food production. When you bring climate into it, both small and large farms can be vulnerable in the same region - especially through a water lens. Lots to snack on! Discussions like this about rural farmers are a good a way to promote and expand the topic. Your blog is great. Nice work Fred.